Could this be it? The greatest pugilist Giants waging war to win the ultimate title of Super Heavyweight Champion of the world and could the victor be crowned as the GOAT? WBC heavyweight champion of the world? Deontay wilder is an absolute knockout artist with a phenomenal record of 39 ko’s out of 40 contests in which he has knocked out every opponent he has ever faced as a professional in the squared circle, as in the rematch against Bermaine Stivern he managed to take him out in literally the last second of the first round. His name appropriately resonates his fighting style as he is famous for throwing wild hooks and hurtful haymakers. He started off more of a brawler and still is, however his skill set has massively improved over the years. He has honed in on his accuracy of shots and has a fantastic snappy jab, he also displays his improved boxing intelligence with the shot selections and combination punches he throws, displayed recently against Luis Ortiz where he annihilated him in the 10th round after being shook himself earlier in the fight. Still with all that skill he still loves to bang out that straight right hand and possesses that one punch knockout power that could shut anyones lights out if it touches them anywhere on the head. Wilder likes to brawl and bash his opponents, break them down and finish in fierce savage style. We can talk attributes: length; power; speed and both fighters tick all of the boxes, also both have unbeaten records. It will then be a case of who can make the other one fight their style. Fury will box and spoil and Wilder will shake him off and look for the overhand right as Tyson enters the clinch. Or will Wilder want to box long and display his pugilist skills and shock everyone like Fury did to Klitschko. The likelihood is however Fury will bob and weave and Wilder will get more and more desperate and keep firing the right hand until it finds a home on Fury’s head. 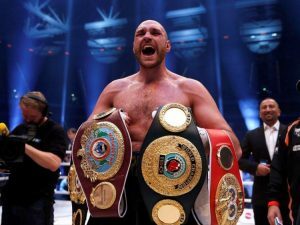 With the deal being reported by Frank Warren (Tyson Fury’s promoter) as nearly done for December we may see how it plays out. Are we going to be given an early Christmas present? Will we see these 2 colossals collide in the ultimate mammoth match of boxer versus brawler for the most prestigious title in Boxing? I hope so.